The firm hired by the City of Hartford to complete the final design of Farmington Avenue is assessing a preliminary design concept to re-shape some of the travel lanes, shorten pedestrian crossings, build textured medians, add road shoulder areas to better accommodate bicyclists and create bus pull outs where city buses can get out of the travel lane and not block traffic. 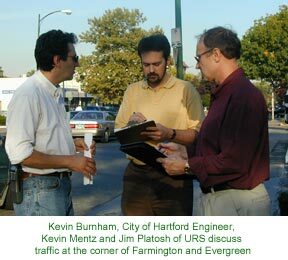 The Rocky Hill based URS team is also evaluating a roundabout at Woodland Street. However, this location does not rate well by the Connecticut Department of Transportation’s newly developed criteria for roundabouts. The city and Farmington Avenue Alliance will be reviewing the URS assessment and be making a recommendation on a roundabout proposal within the next several weeks. The first phase of streetscape improvements will cover the area from Marshall/So Marshall Streets in Asylum Hill to Evergreen/Kenyon Streets in the West End. There will be no work done in the vicinity of the Sisson Avenue intersection in this phase. While this intersection is considered by many to be the most problematic area of Farmington Avenue, making improvements there would have taken up a large percentage of the $3.5 million available for this phase of the project. The Alliance will continue to press for funds for the Sisson/Sherman intersection to be upgraded in a future phase. Currently the URS team is evaluating the proposed street redesign from a traffic viewpoint. They are looking at current and projected traffic volumes to determine if the new lane layout will effectively accommodate vehicles. The City of Hartford expects to have the engineering firm, URS, under contract for the final design of Farmington Avenue streetscape improvements by early September. According to Kevin Burnham of the Department of Public Works, all that's needed is the paperwork to be signed. Since October 2004 the Farmington Avenue Alliance, URS and the City has been discussing what the scope of the project should be. The City was reluctant to include some of the innovative design features proposed by the Alliance’s Farmington Avenue Plan. Features that would have increased pedestrian safety, such as raised medians, raised crosswalks and re-arrangement of sidewalks to reduce pedestrian/car conflicts had the City concerned. It feared negotiation with private property owners over easements would delay the project; new at-grade curbs at side streets would increase the project budget and raised medians may confuse drivers, impede emergency vehicles or create long term maintenance issues of landscaping within the median. The City was also concerned that bus pullouts may require land takings which would slow the project and would not be affordable. The Alliance, having built community consensus on the need to physically re-shape Farmington Avenue in a dramatic way in order to increase the economic viability and livability of the Asylum Hill and West End commercial districts, objected to the direction of the scope of the project. After several months of discussion, the gap in the vision of the City and FAA for the new streetscape closed. FAA committed to doing a lot of the leg work needed to get private property owners to cooperate in the re-design. If property owners are flexible, the City will incorporate new street and sidewalk layout into the final design for the avenue. The Alliance will continue to advocate for pedestrian enhancements. Construction of the streetscape project will begin in the 2006. Notices of all public meetings will be posted on the website. The City of Hartford expects to have the engineering firm, URS, under contract for the final design of Farmington Avenue streetscape improvements by the end of March. Since October the Farmington Avenue Alliance, URS and the City have been having a dialogue about what the scope of the project should be. The City has been reluctant to include some of the innovative design features proposed by the Alliance’s Farmington Avenue Plan. Features that would have increased pedestrian safety, such as raised medians, raised crosswalks and re-arrangement of sidewalks to reduce pedestrian/car conflicts have the City concerned. It fears negotiation with private property owners over easements would delay the project; new at-grade curbs at side streets would increase the project budget and raised medians may confuse drivers, impede emergency vehicles or create long term maintenance issues of landscaping within the median. After several months of discussion, the City and FAA are now closer in their vision for the new streetscape. FAA has committed to doing a lot of the leg work needed to get private property owners to cooperate in the re-design. If property owners are flexible, the City will incorporate new street and sidewalk layout into the final design for the avenue. The Alliance will continue to advocate for pedestrian enhancements. Initial work on the avenue upgrade will begin in two separate sections of Farmington Avenue. Included will be the area between Marshall and Denison Streets as well as Farmington Avenue between Tremont Street and Prospect Avenue. The Alliance hopes the project can be coordinated with sewer separation on Farmington Avenue by the MDC that will get underway this spring just over the West Hartford line. Construction of the streetscape project is not likely to begin before the 2006 construction season. URS, the firm the City of Hartford has selected to finalize street design plans for Farmington Avenue, will begin work on the avenue as soon as its scope of work is approved by the City. However, in mid-October members of the design team, area residents and representatives of the Farmington Avenue Alliance and Farmington Asylum Business District participated in a walk through of the whole length of the project area – from the Asylum/Farmington merge near downtown Hartford to the Prospect Avenue. The team wanted to get a good look at the street and listen to community concerns. The City has asked URS team to work closely with residents and businesses to develop the design. Neighborhood residents and business representatives also met with the engineering team in mid August. Click here for a report (pdf) of the initial meeting with the URS team. The URS expects to hold public workshops during the preliminary design phase and public meetings at different phases during the developed of the design. The City of Hartford recently named URS, a large corporation with expertise in transportation planning and design, to head up a team to improve Farmington Avenue. URS will work with the community to refine a design developed by the Farmington Avenue Alliance in 2001. The plan, developed with extensive input from the Asylum Hill and West End community, seeks to improve the avenue for pedestrians, cyclists and motorists while creating a better climate for businesses. The City has asked URS team to work closely with residents and businesses to develop the design. Neighborhood residents and business representatives met with the engineering team in mid August and will do a walk through of the avenue in early September. Click here for a report (pdf) of the initial meeting with the URS team. Bhupen Patel, Director of the City of Hartford’s Department of Public Works, has invited fifteen neighborhood groups, including West End and Asylum Hill organizations, to meet on August 16 at 6:00 P.M. at Conference Room “A”, Center of Health Enhancement, 95 Woodland Street, to discuss the general scope of streetscape projects the city is ready to undertake. Farmington Avenue is one of five arteries in the city that will be upgraded. The City intends to work with stakeholders from the neighborhood to get input into the street design. The City of Hartford’s Department of Public Works applied for a $900,000 grant for Farmington Avenue and two other city streets from the Capitol Region Council of Governments for STP-Urban Funds, a federally funded transportation program. If awarded, these funds would be added to streetscape funds the city plans to use to begin implementation of the Farmington Avenue Plan.